Yeah, we lost to them for the first time this season. Watching that wretched team score 7 times on us nearly made be snap. Maybe its just the lack of sleep from the new baby, but I think its just a hatred so deep I actually wish harm on their families, at times. Either way I can't do a recap tonight, I can't. Figured since I haven't done a photoshop in a while it was time for that. I don't take credit for the picture itself, just the modification of it. Will become a new mantra around here, I suggest you join the cause. Oh, and I don't want to hear its not the end of the world and some of us need to get a life. Well, to me the Pens are a lot. When they win, I celebrate. When they lose, I practically mourn. I'm a sore loser, I am. So what, deal with it. 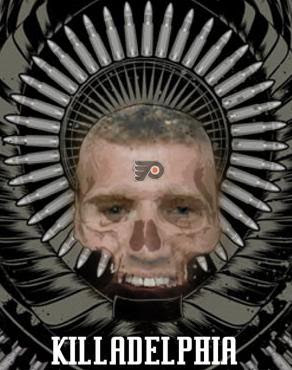 Bottom line, I hate losing to the Flyers. I'll come back to reality soon.